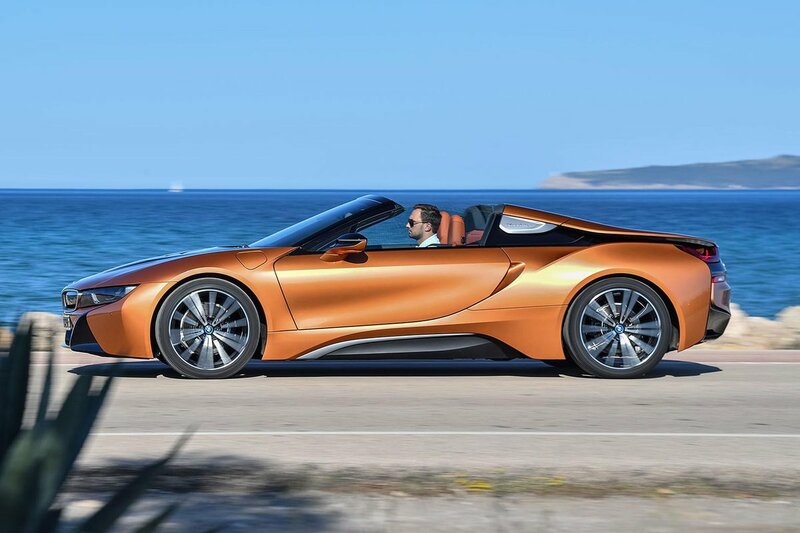 BMW i8 Roadster Performance, Engine, Ride, Handling | What Car? If you’re in the market for a fast, flashy cabrio costing well over £100,000, you probably want it to sound rather racy. 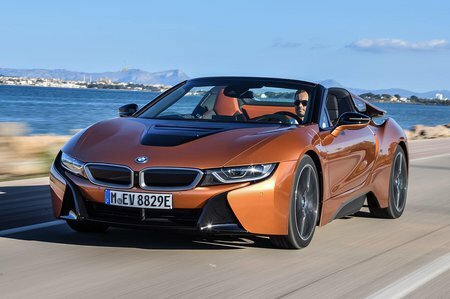 You might think the i8 Roadster’s Mini-derived 1.5-litre three-cylinder turbo engine would roar like a dormouse, but it actually emits a fruity rasp. Sure, you won’t get it confused with a thundering V8 or V10, but there are shades of Porsche 911 to the exhaust note. Even though some of that noise is generated by a speaker, the i8 does sound good. It’s quick, too. 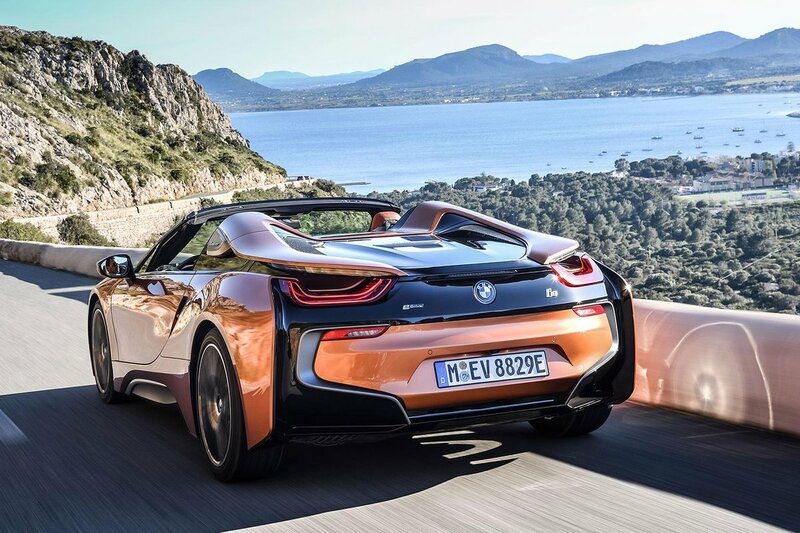 With the engine helped by a front-mounted electric motor, the i8 can sprint from 0-62mph in 4.6sec. That’s certainly quick, but it’s some way off the likes of the Porsche 911 Cabriolet and Audi R8 Spyder. Of course, neither of those rivals can run near-silently on electric power – something the i8 can do for up to 33 miles on a single charge. The switch between electric and engine power is smooth, as is the six-speed automatic gearbox. The ’box can be a little hesitant to change down in manual mode, though. Despite having a load of batteries on board, the i8 is light for a car in its class, thanks to carbonfibre-reinforced plastic construction. It also stiffens the car, so there’s very little of the flex you’ll often experience from a convertible’s chassis –perfect for good handling. Indeed, the steering is precise and the car changes direction very keenly, while the four-wheel drive system ensures it has loads of traction when you’re exiting tight bends. Although most people will appreciate the car’s sure-footedness, enthusiastic drivers might prefer the more playful nature of the 911 or R8. As for the ride, it’s firm but not unbearably so, thanks in part to standard-fit adaptive dampers. You will notice a fair bit of road noise, but the hood does a good job of insulating you from wind noise. With the roof down, buffeting is kept to a minimum, so you can have a conversation with your passenger at motorway speeds. It takes 15 seconds to raise or lower the roof, and this can be done at up to 31mph.